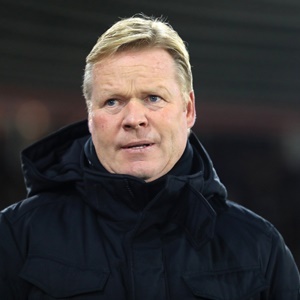 Cape Town - Ronald Koeman is fearing the sack as Everton manager after the Toffees were condemned to yet another defeat. Everton have won just twice in their last 12 games in all competitions and are bottom of Europa League Group E after a 2-1 defeat to Lyon on Thursday. A late winner from Bertrand Traore was enough for Lyon to silence Goodison Park and with Arsenal the visitors to Merseyside on Sunday, Koeman knows his position will be coming under further scrutiny. "Of course, if the team is not winning and the team is not performing but maybe they can, then it's always the manager," he told BT Sport. "The final decision is by the board, it is not by myself. I'm strong, I'm trying to do everything and if the board thinks I'm not that right man on this position then they will tell me." The mood around the club was not helped by a second half brawl sparked by Everton captain Ashley Williams, which saw home fans lashing out at Lyon goalkeeper Anthony Lopes. Koeman said: "That was a certain irritation in that moment by Ashley because he's that player who likes to win, who cannot deal with a lot of disappointments. "But I think the mistake was also by the referee. They made a lot of theatre and he did nothing. [Nabil] Fekir was I think 10 times on the floor diving, not even a yellow card and that has grown our irritation. "Even extra time - it's five minutes. We had six substitutions, that's three minutes. We had the fight, maybe two minutes. And they had I think eight times injuries in the game and it's five minutes? Come on please."